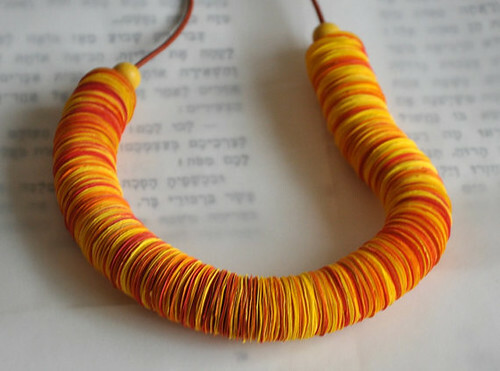 I know, I know... another paper jewelry post. Forgive me if the subject isn't your thing, but let me assure you features are in the works that are far and removed from this topic. You see, after my jewelry post a few weeks ago, even more artists came to light and I can't help but showcase them here as well. First up, cardboard has never looked so good! These graceful Wave sculptures waiting to be made into earrings are by Elisond Holder of Paper Leaf in Rome, Italy. 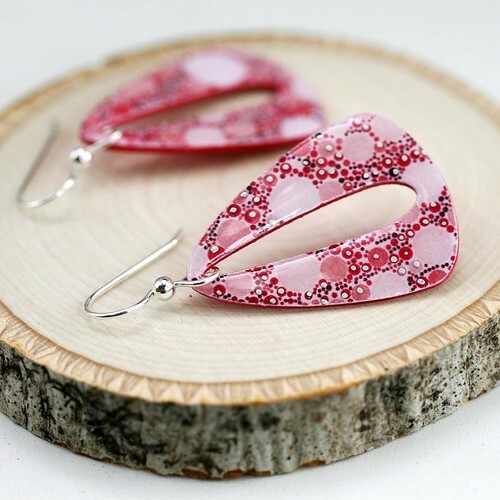 A graphic designer and illustrator, Elisond loves paper, drawing and designing... all of these interests led to making paper jewelry that doesn't look like paper. 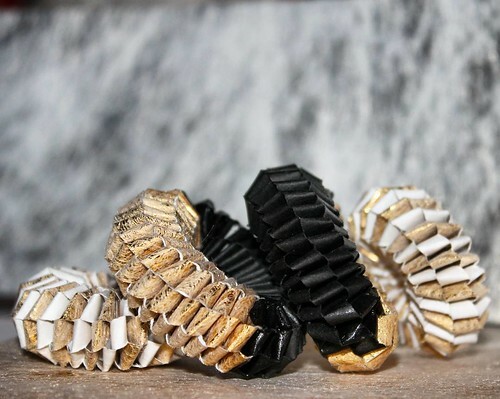 When questioned why she uses such an inexpensive material, she replies that paper can be bent, cut, rolled, painted, carved, and transformed into almost anything. 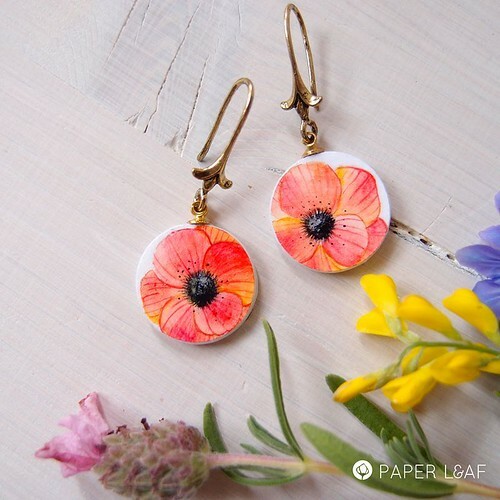 Many of Paper Leaf's floral necklaces and earrings feature original drawings that Elisond hand paints with acrylics on Canson paper. A coating of varnish protects the paper, making it water resistant. She even sends along the original painting from which the jewelry components are cut... such a nice touch. 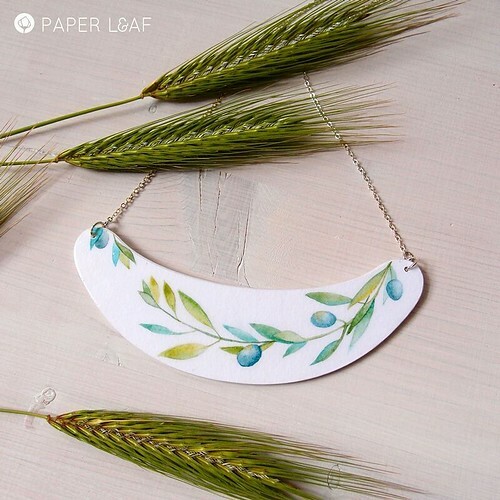 Paper Leaf is on Instagram and Facebook. 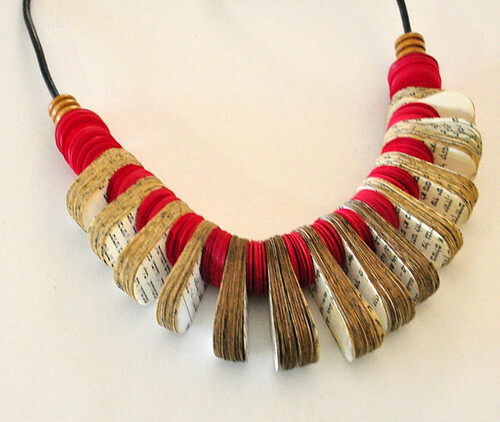 From light and delicate to big and bold... here we have examples of book page jewelry made by Hedva Klein of My Paper Tale in Haifa, Israel. 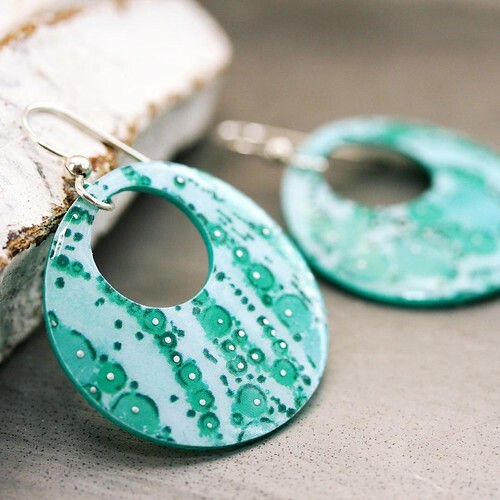 After more than thirty years as a teacher, she began a second career as a mostly self-taught jewelry artist, concentrating on paper. Hedva collects colorful papers along with old books that are no longer wanted. 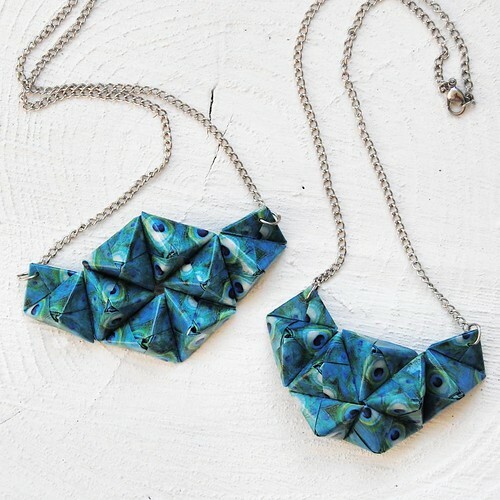 She enjoys cutting the pages into different shapes and combines them to create dramatic statement jewelry. My Paper Tale is on Facebook and Pinterest. 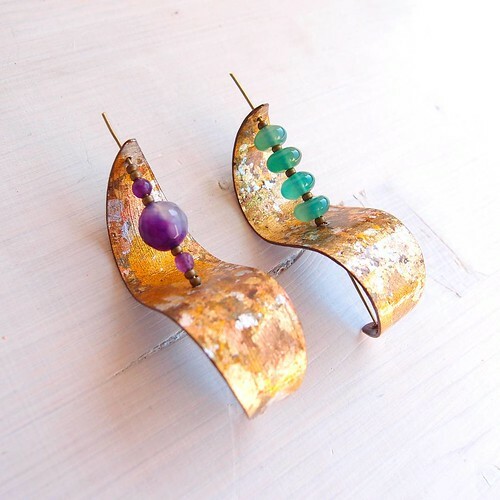 Stephanie Connell of SC Studio located in Stow, Massachusetts has been designing and creating for more than twenty years. Steph's vibrant dotted patterns, designed specifically for use on her handmade items, are printed in many colors and applied to a variety of modern shapes. Even the largest pieces are lightweight and comfortable to wear. 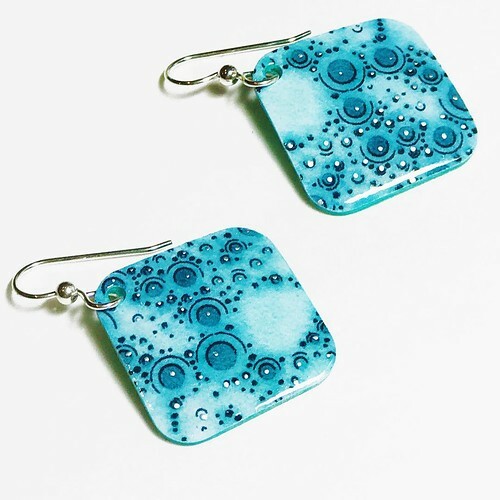 All are glazed for durability and shine, and feature sterling silver findings. SC Studio is on Instagram. 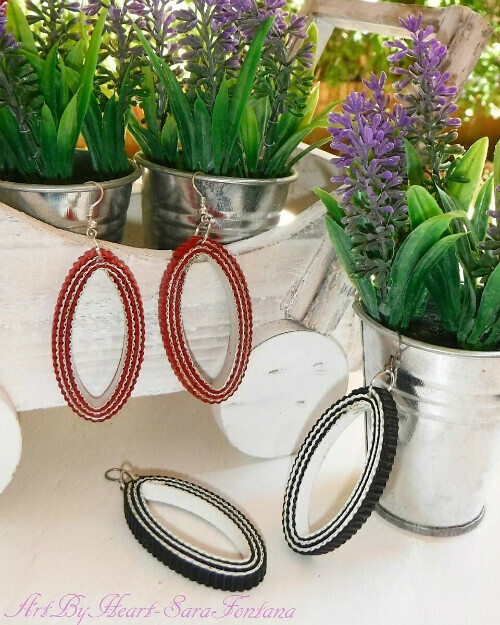 Sara Fontana of Art by Heart in Italy makes stylishly long necklaces and layered paper earrings using rolled and crimped paper strips. She also enjoys quilling, string art, and pop art, and appreciates the ecological aspects of working with paper as her material of choice. I'm admiring the glossy colors of this circular pendant. Sara of Art by Heart is on Instagram and Facebook. 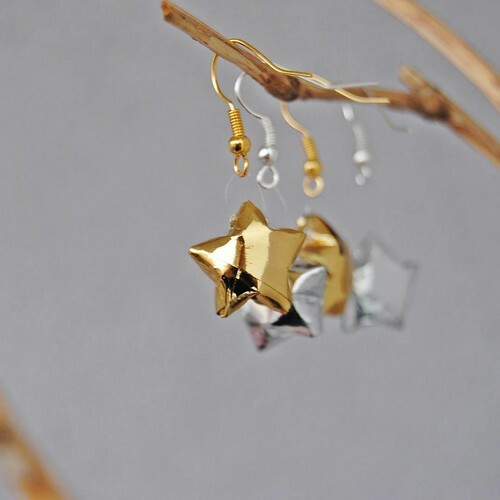 Alice of Diffizil in Gara, Germany creates paper jewelry and decor using origami to great effect. 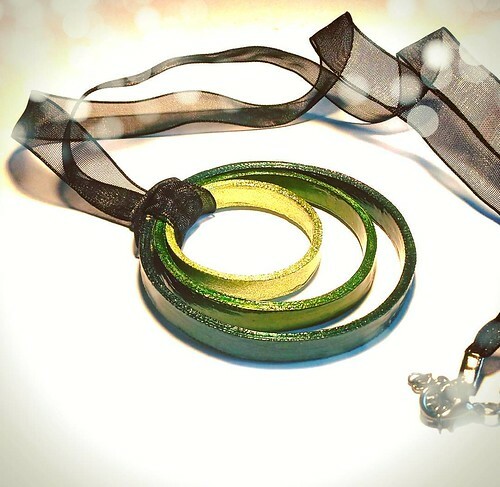 She often works with pretty metallic papers. Little puffy stars are always a hit, as are peacock feathers. 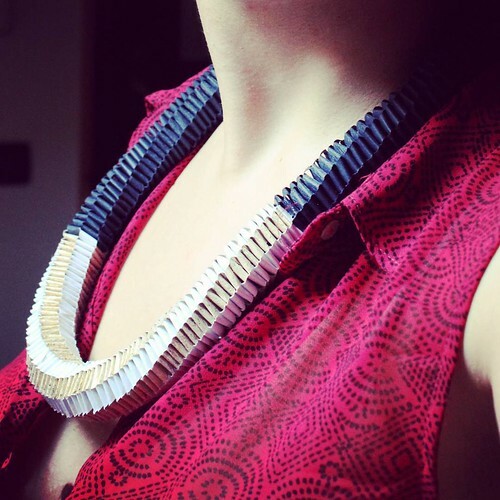 Laura De Martino of Arual Dem Paper Jewels has been making bold woven paper jewelry since 2010. She has a degree in Product Design from the University of Florence, is a graphic designer, and street artist in Florence, Italy. Laura upcycles pages from magazines for her work, and also uses more valuable papers from Favini, a paper mill in northern Italy. 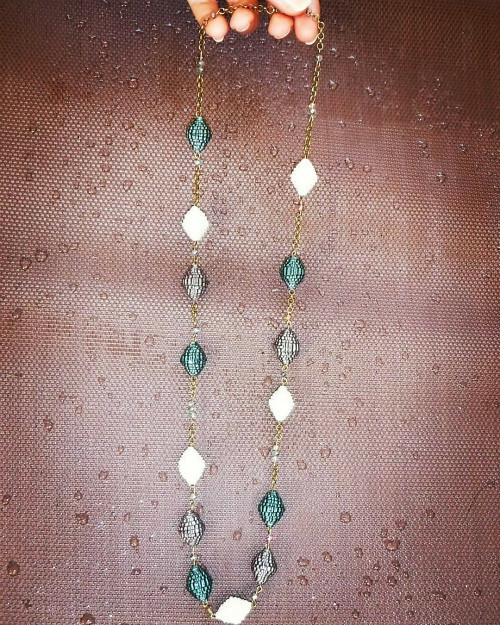 The jewelry findings are sterling silver. 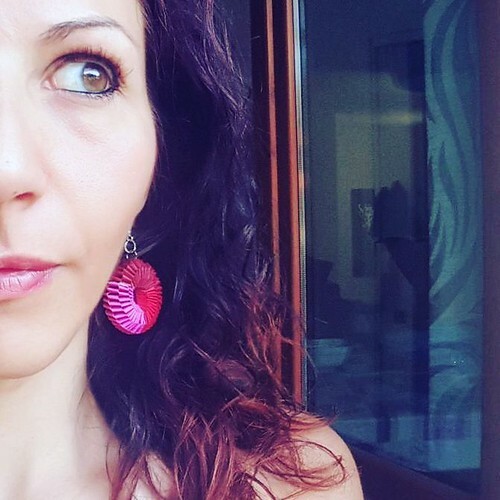 Follow along with Arual Dem on Instagram. These are gorgeous and very inspiring. Thanks for sharing. Good point, Karin. :) Chalk it up to wanting to please as many of my readers as possible. So glad you enjoyed the post, Lorraine! 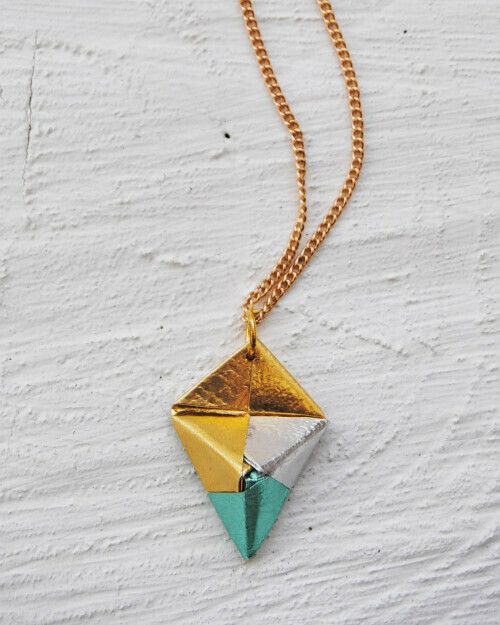 Gorgeous jewellery, lovely post. Thanks for sharing! CC, I'm glad you enjoyed the post! Thanks for commenting.